Having cats can be a real joy, but it can also be murder on your furniture if you don’t have something appropriate for them to sharpen their claws on. Cats need to be able to claw at things, so you need to make sure that you have scratching posts around your home, so they can do just that. DIY plans to build your own cat furniture are one option for some people. Or invest in the MidWest Feline Nuvo Cat Furniture Grand Forte, a highly durable cat scratching post that is tall and slim and will fit just about anywhere in your home. Let’s take a look at and review some of the great features of this scratching post, as well as the pros and cons. The Midwest Feline Nuvo Grand Forte is designed for cats and their owners. This is one of the sturdiest scratching posts you can get for your cat, and one of the tallest. It is ideal for all of their scratching needs, including grooming (keeping their nails sharpened, wiping their fur, etc.). This is going to keep your cat from doing a lot of damage to your furniture because they will have their own special grooming area. If you have any problems with this scratching post, you can contact customer service about a replacement item. MidWest offers a one-year, limited warranty against any manufacturer defects. The customer service is second to none, and MidWest has an award-winning customer service team on hand to help customers. There aren’t a lot of parts and pieces to fiddle around with when assembling this scratching post. It can be put together in just a few minutes, and everything you need is included, even the tools. All you have to do is attach the pole to the base, and it is ready for your cat to use. 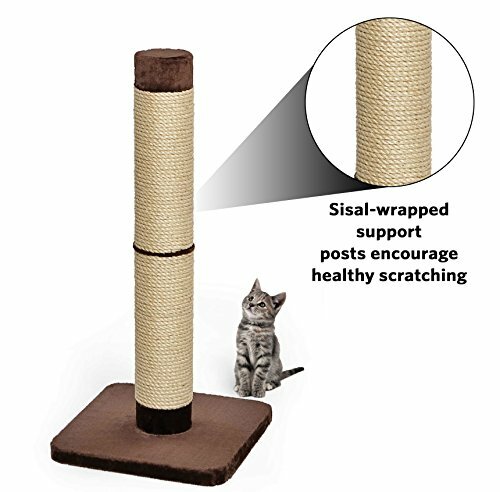 The supports are wrapped in sisal, making them tough and resilient, so your cat can scratch for hundreds of hours before you need to get them a new scratching post. You will be getting plenty of value for less than $40 when other, less durable cat scratching posts can cost twice as much. The MidWest Feline Nuvo Cat Furniture cat scratching post has a super-sturdy base that will keep the unit from toppling over when your cat is stretched out and scratching at it, even when they are scratching near the top. The base is also covered with a soft, furry fabric, which cats love, and even though it is not meant for sleeping, your cat will probably snuggle right in. Why Do Cats Need to Scratch Things? Cats scratch at things for several reasons. One of the main reasons is to keep their nails trim and sharpened, which help to keep nail clipping to a minimum. They also scratch at things to mark their territory, as there are scent glands in their paws. Unless they are trained to use a scratching post, such as the Grand Forte, they will find other things around the home to scratch on, and they can be pretty destructive. This is a great cat scratching post, and plenty tall enough, but it doesn’t come without its drawbacks. Before you spend any money, it is important that you know about all of the good and bad points about any product, including your cat’s scratching post. Let’s take a look at the pros and cons of the MidWest Feline Nuvo Cat Furniture; Durable Cat Trees & Cat Scratching Posts Nuvo Grand Forte. Cats need to be able to stretch out while they are scratching, to stretch their muscles. 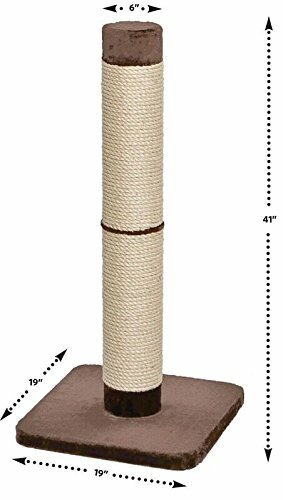 Even the tallest of cats is going to be able to stretch out to its full length when you have this extra-tall cat scratching post in your home. While there is no sleeping area per se, there is a super-soft base that cats love to sit and lay on. Don’t be surprised if you find your cat sound asleep, curled up around the post after a busy scratching session. Some scratching posts have lightweight bases, making them topple over easily while cats are using them. This scratching post has a sturdy base that ensures your cat can safely scratch to their heart’s content. Cats love to climb, and unfortunately, they tend to climb on our furniture. You can avoid this problem when you have the Midline Feline Nuvo Grand Forte. Because this scratching post is so tall, cats can easily climb, and the sturdy base will keep it from tipping over. This is strictly a scratching post. There is no flat area where your cat can lay down and stretch horizontally. But, if you have a separate bed for your cat, this really doesn’t pose much of a problem. Many people think that a better scratching surface is one made from sisal fabric rather than sisal rope. For one thing, the rope isn’t as durable as the fabric. Also, cats seem to prefer the feel of the fabric over the rope. Due to errors in packaging, you may receive the wrong product or the right product with missing parts. All you have to do is contact customer service, and the correct product will be shipped out to you. Some of the extra-tall cat scratching posts can cost well over $50, and some even cost over $100. The MidWest Feline Nuvo Cat Furniture; Durable Cat Trees & Cat Scratching Posts Nuvo Grand Forte is available at less than $40, and it is going to save you hundreds, if not thousands of dollars because your cat won’t be destroying your furniture. Who wouldn’t want to spend $40 for that kind of peace of mind? This is a quality scratching post that is so durable that it comes with a one-year guarantee, so you know you are going to be getting your money’s worth.